There is one family of Kestrels which nests regularly on Long Reef. 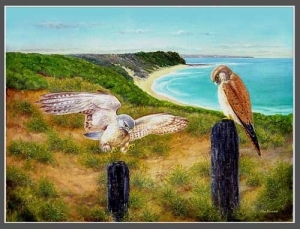 In the mid 90s, sightings were made above the Rock Pool at Collaroy (Northern end of the Aquatic Reserve), where Kestrels sit on the light poles in search of food. The mother during these early years would eat meat placed on the fence to feed her young back in the nest. Kestrels do not ‘build’ nests but use ledges in the cliff to lay their eggs. When feeding they hover above the ground some five metres high searching for prey, then swoop on small lizards, mice, grasshoppers and beetles to feed. They can be seen perched on tall trees and poles around Long Reef looking for food. They gorge themselves before flying back to their nest to feed their young. Their feeding territory is the headland cliff tops and golf course grasslands. They cover all of the Aquatic Reserve area – even around to the Collaroy Rock pool. The birds appear to hang quite motionless as they hover in the updraught of air above the cliffs. Their breeding season is July through November. Up to five nestlings hatch, but only the largest usually survive. Normally the ones that hatch first get more food brought to them by the adults. The native grassland area on the eastern face of Long Reef Headland was once a feeding ground for Kestrels. However in time this whole area had become overgrown with the weed Bitou Bush. The once flourishing native Kangaroo grass themeda australis had almost disappeared from the headland cliff face area and only existed in small areas of the golf course. A small patch existed on the reserve above Fisherman’s Beach. Reefcare volunteers have removed much of the Bitou and revegetated some of these areas.